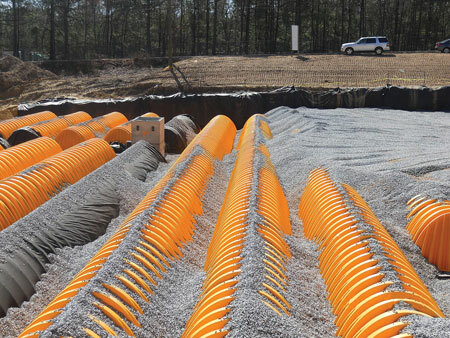 The new StormTech® chamber developed to contain and control storm water runoff in an underground system is now available from Advanced Drainage Systems, Inc. (ADS). The StormTech MC-4500™ chamber is designed in accordance with AASHTO and ASTM design standards, making it a qualified choice for use in commercial and municipal projects. Manufactured using a high performance impact modified polypropylene (PP), it is rated by ADS for a 100 year service life. Able to handle large storm water flow volumes, the MC-4500 measures 5-feet from the bottom to the top of the corrugation and has a base of more than 8 feet. The MC-4500 provides more storage volume per square foot of land area than any other chamber on the market. It can be used with a minimum of 24 inches of cover and is generally installed under parking lots. "The practicality of a subsurface unit is being embraced more and more by engineers, urban planners and architects,” observed Ron Vitarelli, Vice President of Storm and Sanitary Sewer Market Development for ADS. “It saves valuable space, reduces land use, provides a means to meet EPA regulations, and is a long-life, easy-to-install solution. The MC-4500 and our other StormTech products provide a highly cost-effective method for controlling storm water."